"Joyce Ann Bemis, Westbrook College, Class of 1977"
Westbrook College student Joyce Ann Bemis, Class of 1977, was a Medical Assistant major and lived in Proctor Hall. 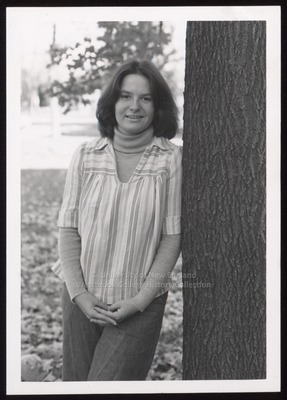 For her senior class candid photo, which appeared in the 1977 Tower Yearbook, she wore a striped, V-neck blouse over a turtle neck jersey, and linen pants. Her dark hair was shoulder length, parted in the middle, and curled under. Joyce, with hands clasped in front, leans against a tree trunk on the Campus Green.